Dodge is a reliable car brand. Power steering pump is broken. Needs a power steering flush and an oil change. Transmission was done a couple years ago. It needs new brakes, brake pads & struts. It needs a tire rotation. Heat and ac and defrost work. Windshield wipers work. Only driver door can control buttons like rolling down the windows. Leather interior is tan. Heated seats. It is an SUV so it is a gas guzzler. A couple speakers are blown out. It is a 17 almost 18 year old car. I learned how to drive in this car when I was in high school. Good family car. Spacious. I love how the back seats fold down. Dodge Durango's are the most reliable vehicles ever! It's roomy for every type of person. The vehicle we have has heated seats which is awesome! I'm sure by now, air conditioned seats are available!! 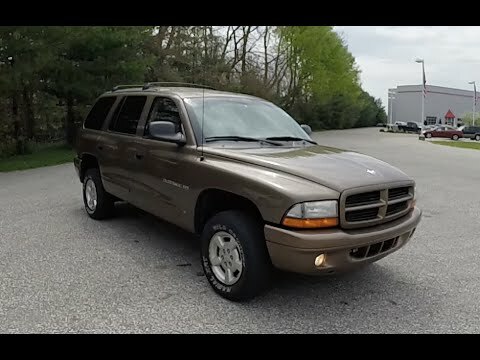 My 2001 Dodge Durango is the best car my husband and I have ever bought. It's 17 years old and still runs great! My husband does all the maintenance on a regular schedule. It has taken us on many road trips in and out of Colorado. If we were to buy another vehicle, it definitely would be a Dodge Durango! We've had minor issues throughout our 17 years, but nothing that couldn't be fixed. It's also a very comfy SUV. Lots of legroom and the third seat is great when you have kids! I'll definitely be buying another Durango when the time comes. Our Durango serves our family of 5 well. My Dodge Durango is amazing. It may be old but it humid down the road with plenty of life left in her. She seats 8 very comfortably which means our kids can have friends join on outings. We put our vehicle to the test with road trips, camping, and taking afternoon drives to explore. She is showing her age with some rust in the hood and an odd bit of mechanical trouble here and there. With a little elbow grease, my husband has replaced the radiator. I see my Durango being a part of our family for a few more years to come.